I. How much THC makes it into breast milk? II. What are the effects on the child? I recommend reading my post on the Human Metabolism of THC. Knowing about how THC—the main active ingredient in cannabis—is metabolized will increase your understanding of the topic. For those in a hurry: at minimum check the infographic and use it as a cheat sheet. “It is generally accepted that all medications transfer into human milk to some degree, although it is almost always quite low. Only rarely does the amount transferred into milk produce clinically relevant doses in the infant.” reads the introduction to the reference book Medication and Mothers’ Milk.1 It is widely used in American hospitals to determine contraindications of drugs for breastfeeding mothers. The chapter on THC is short and doesn’t contain original research. Yet. We don’t know how much marijuana was initially consumed. We don’t know how long since the last marijuana consumption. With a one-time measurement we don’t see how the THC concentration in breast milk behaves over 24 hours. Both mothers were heavy users who were consuming marijuana on a daily basis. With regular use, THC accumulates in the body over time, especially in fat. And there is a lot of fat in breast milk. We don’t know which part of the detected THC is due to accumulation and which part is recently consumed THC. A sample size of two isn’t representative for a larger population. True? There is eight times more THC in breast milk than in blood? Once upon a time in 19823, there was one cannabis smoking mother who agreed to have her blood and breast milk analyzed simultaneously for THC. She was a heavy user, smoking marijuana out of a pipe seven times per day. About one hour after her last consumption the researchers took a sample of her blood and breast milk. It turned out, THC levels in her breast milk were eight times higher than in her blood. The 8:1 ratio was solely an observation regarding that particular case of the heavy using mother. In my eyes, those researchers are heroes for collecting and sharing that data. But they would surely not approve people quoting that 8:1 ratio out of context. In short: that study did not find that the THC concentration in milk is 8:1 compared to blood. This ratio was true for one case and one case only. THC blood levels have proven to be highly variable across subjects. THC blood levels drop soon after consumption because THC is rapidly taken up by fat tissue. It’s plausible therefore that THC levels would be higher in milk because of its high fat content. Recreational users clear their systems faster. 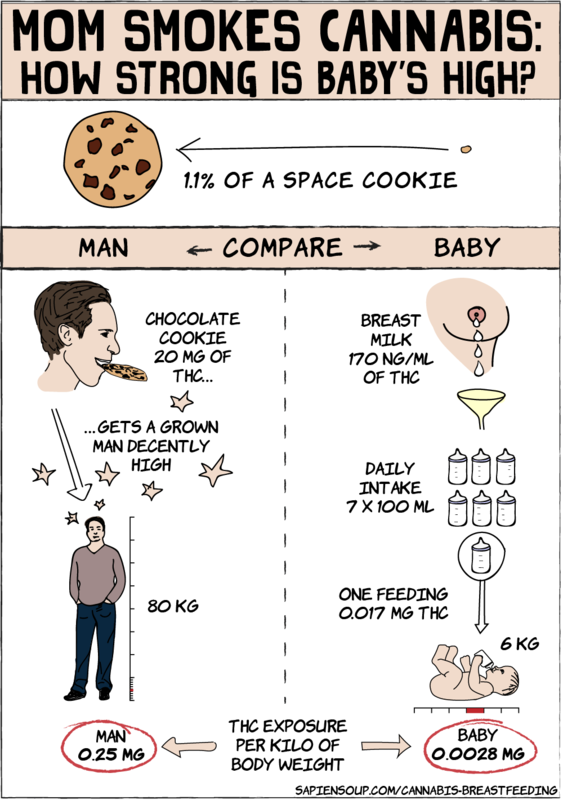 The baby experienced the equivalent of a space cookie’s crumb. Be that as it may—half a crumb or three—you get an idea about the magnitude we’re operating at. Keep in mind however, that a new crumb is added to the pile every time the baby feeds. The crumbs are getting smaller but we don’t know how fast. To my knowledge there is no study examining the rate of THC elimination from breast milk and that’s precisely the problem. Not knowing how fast THC clears from breast milk is what’s keeping responsible mothers from a responsible use of cannabis. 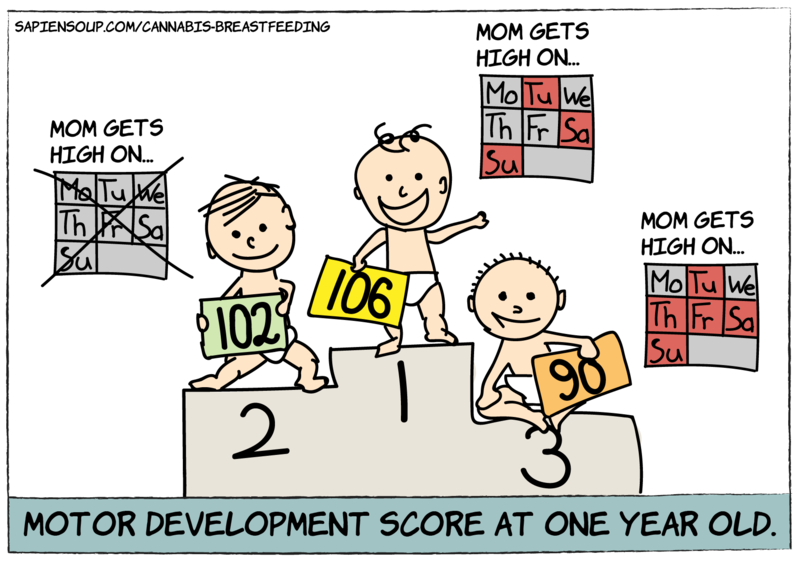 Ironically, the kids whose mothers used cannabis less than 15 days per month scored higher than the kids of non-users. The narrow lead wasn’t statistically significant though, which means that there was no difference between kids of occasional users and non-users. Furthermore, no differences in mental development were detected amongst any of the three groups. The few samples analyzed all came from mothers who smoked on a daily basis. With regular use, THC accumulates in fat deposits, from where it is slowly released back into the bloodstream. That’s why the half-life of THC is longer in regular users. Recreational users show lower THC levels in blood and urine and clear it faster from their systems. How fast THC is cleared from specifically breast milk has not been researched yet. Whether the transferred THC has adverse effects on the child is controversial. (Thin) evidence supports both sides of the argument. Heavy cannabis use in the first month of life might result in inferior motor skills at one year old. But that could also be a result of regular cannabis exposure during the preceding pregnancy. I believe the reasons why a nursing mother would decide to consume cannabis are personal and complex. Furthermore, I believe that most mothers care deeply for their baby and wouldn’t make such a decision lightly. Personally, I was scared of consuming marijuana while breastfeeding and refrained from even taking an aspirin. But also, I didn’t have the information I have today. Maybe today my decision would be different. Eating vs. smoking. Ingesting cannabis produces a similar high but at a considerably lower THC exposure. Start small. Side stream smoke. Side stream smoke poses a risk to anyone, including you and your baby. Besides THC it holds carcinogens and other toxins. Backstop. Have someone sober around who can take over with the child if needed. With varying potency of product, effects can be unpredictable. Especially casual users can experience paranoia or impaired judgement. Caring for a child in such a case can be difficult. Timing matters. During pregnancy and the first three months of life, a baby’s developing organism is most vulnerable. During that time keep exposure to a minimum. Minimum effective dose (MED). The less, the better – true for almost anything.